This year, I made it a point to finally ditch my beaten, battered, cat scratched, and barely functioning luggage in search of something durable and family friendly. But was there really such thing as family friendly luggage? I was determined to find out. After scanning the internet, desperate to find something that would make my life easier during our 20+ trips per year, I came across Eagle Creek’s Pack-it System. Their website assured me that their system of folders, cubes, sacks, and organizers would make my life easier. I was definitely intrigued by the concept so I decided to contact Eagle Creek and put the system to the test. The Pack-it System became my travel hero. Before I start waxing poetic about the many reasons to love my cubes, I first should start with the shell I use to carry them all, the Eagle Creek Tarmac 25. 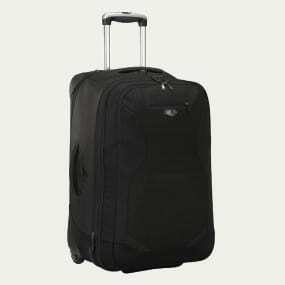 This 17 x 25 x 12.5 inch bag (standard check-in suitcase size) only weighs 9 1/2 lbs! In a world where families are constantly struggling to stay under the 50lb weight limit, a lightweight suitcase is like a golden ticket which ensures your passage through the check-in lines without extra fees. I have stuffed that suitcase until it couldn’t possibly be stuffed any more and still come well below the 50lb limit. Take that nickel and diming airlines! My Tarmac is the vessel for the Pack-it System that I love. 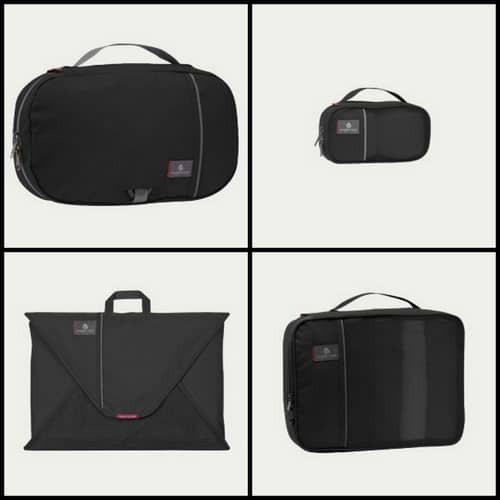 The system uses self contained little pouches to organize clothing, and make the best use possible of the space in your suitcase. The centerpiece of the system are the cubes, which come in a variety of sizes and shapes. I can use one standard sized cube for each of my kids, and pack their shirts, pants, and shorts in one spot. I roll their clothes in the cubes, keeping things as wrinkle-free as possible, resulting in a 14×10″ pouch that I can easily take out of a suitcase and put into a drawer as we hop from destination to destination. Unpacking takes 2 minutes and I can put the suitcase in the closet and not have to think about it until we are ready to move on. Socks and underwear end up in a smaller cube while extra shoes hang out in their own little compartment. I use a half cube to throw in sweatshirts or anything I want easy access to from the front zipper of the suitcase. A folding toiletry bag holds, well, the toiletries! You get the picture. There is a cube built to serve pretty much ever purpose you can think of. I even have a folder that is perfect for my dresses, pants, other things I want to keep flat. I am telling you, they have thought of everything. Besides allowing me to stay organized, the Pack-it System also helps me pack a heck of a lot into one suitcase. I have used this suitcase and system now for three seasons. My kids and I shared a suitcase on a 5 day trip to Mammoth in the winter, along with a duffel to carry our ski jackets and snow boots. Anyone who has packed for the snow can understand just how impressive that is! I also managed to pack my kids into that same suitcase for a 3 week trip to the Pacific Northwest, where I was forced to pack for every possible condition due to the region’s finicky weather. As we toured the Olympic Penninsula and stayed in different lodging each night, I simply slipped out my cubes and found what I needed without a moment of hassle. So it is true. There is such as thing as family-friendly luggage after all. Eagle Creek has managed to make traveling easier for my family and any company that helps me spend less time stressing and more time enjoying deserves all the praise in the world. *All photos courtesy Eagle Creek Luggage. Disclosure: I received a complimentary suitcase, duffel, and pieces of the Pack-It System in order to review the products. Eagle Creek did not ask that I state any particular opinion and certainly did not ask me to gush about the fabulousness of their luggage. I just couldn’t help myself!